Wayne Thompson is the Manager of SAS Predictive Analytics Product Management at SAS. He is described as one of the early pioneers of business predictive analytics and is globally renowned presenter, teacher, practitioner and innovator in the field of predictive analytics technology. He has worked alongside the world's biggest and most challenging organizations to help them harness analytics to build high performing organizations. Over the course of his 20-year tenure at SAS he has been credited with bringing to market landmark SAS analytics technologies (SAS Text Miner, SAS Credit Scoring for Enterprise Miner, SAS Model Manager, SAS Rapid Predictive Modeler, SAS Scoring Accelerator for Teradata, and SAS Analytics Accelerator for Teradata). Current focus initiatives include easy to use self-service data mining tools for business analysts, decision management and massively parallel high performance analytics. 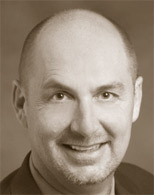 Wayne received his Ph.D. and M.S from the University of Tennessee in 1992 and 1987, respectively. During his PhD program, he was also a visiting scientist at the Institut Superieur d'Agriculture de Lille, Lille, France. In this webcast, we will use SAS Visual Analytics and SAS Visual Statistics to teach you how to quickly identify predictive drivers. Join us to learn more about how to reveal insights in your Big data and redefine how your organization solves complex problems.